Whether you're gaming or streaming, these tricks can work for everyone. 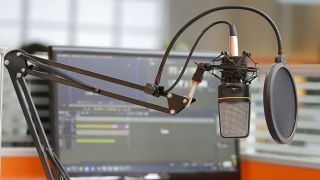 Here are our picks for the best microphones for gaming and streaming, as well as advice for how to set up a streaming studio for less than $150. So, you’ve just started streaming or recording voiceovers. You’ve bought a mic that everyone else seems to love, plugged it into your computer, but your voice just doesn't sound right. There’s echo. There’s humming sounds. There’s your neighbor’s dog barking in the background, the one that never stops barking. How do you get rid of all that, or at least make it less noticeable? I recently got back into streaming and have had to deal with all those annoying things. So here’s a few tricks I’ve learned to get the most out of my mic. Depending on if your mic is a front-address or a side-address, you’ll want to make sure it’s aimed toward your mouth at the appropriate angle. Front-address mics should be tilted at an angle toward your mouth so your voice hits the head of the mic. A side-address mics pick up sound from the side, rather than the top, so you’ll want to orientate the mic head vertically. The Blue Yeti, for example, picks up sounds from the side, so positioning it at a 90-degree angle will make your voice sound the most clear and crisp. If you happen to have a Blue Yeti or another side-address mic and you’ve been angling it wrong, do a little experiment and test out the difference. It’s noticeable. You’ll also want to make sure the right recording pattern is selected, if your mic offers multiple modes. The Cardioid pattern is the best for a single individual talking directly into the front of the mic. Its recording area fans out like a cone, keeping any noise coming from behind the mic to a minimum or canceling it out completely, depending on how far away the noise is. Finally, place the mic a reasonable distance away from your mouth, usually several inches. The further away the mic, the further away you are going to sound. Sounds intuitive, right? It is. Preventing the mic from picking up ambient noise in Cardioid mode is a bit trickier, especially if you have a hypersensitive mic like the Blue Yeti. I’m constantly trying to find better ways to get rid of ambient noise sources so my mic doesn’t pick up buzzes, or hums. I live next to a busy city street, so I have to keep the windows closed when I record or stream. I also have a plethora of fans in my house that I turn off. My mic also picks up the fans in the server I have running near my desk, which I would move if I could, but my space is limited. So, if you are hearing lots of feedback, the easiest and simplest solution is to turn off any fans and close your windows. You could also invest in a more creative solution like noise-reducing curtains or foam panels, anything to dampen ambient noises from both outside and inside your home. (Windows are especially notorious for bouncing sound waves.) If you absolutely need that fan on because your room is the hottest room in the house like mine is, then take a look at the layout of your desk and the rest of your furniture. Can you easily move your furniture around in a way that still utilizes space efficiently? If not, put the fan on the other side of the room so you can be comfortable while minimizing noise at the same time. One problem I run into with my Blue Yeti is picking up the sound of me furiously typing away. Other than getting a quieter keyboard or a shockmount (more on that later), my solution so far has been to move my keyboard behind my mic. It helps a bit. If you’ve done all that and your voice still sounds weird, then the room acoustics might be to blame. A small, 10x10 room with a flat ceiling is going to sound different than a large living room with a vaulted ceiling, so you might be hearing a bit of an echo when you record, which is just the sounds from your voice bouncing off the walls back into your mic. Vaulted ceilings have great acoustics for watching a movie or listening to music, but they’re not so great for streaming, recording voice overs, or for anything other kind of recording where you need to eliminate echo. Your type of floor also affects how sound bounces around the room. Carpet will absorb more sound than tile, for instance. If you don’t have a carpeted space, consider throwing down a rug or two to cover as much of the floor as possible. Just don’t hang carpet or rugs on the walls as a substitute for foam paneling. They’re only thick enough to absorb very high sound frequencies. Having lots of objects in your room can help absorb or diffuse sound waves, too. Bookcases, paintings, curtains, furniture in general—all can absorb or diffuse sound waves. Covering your mic with a windscreen or popfilter can also help. Another unwanted sound source is desk vibration. Free standing mics like the Blue Yeti have foam padding on the bottom, but the padding is on the thin side, so any low frequencies like accidentally knocking your knee into your desk are going to get picked-up. If you have a home voiceover studio or are seriously into streaming, considering investing into a shockmount. An important thing to note about shockmounts is that the elasticity of the suspension must match the mass of the microphone. It’s generally a good idea to buy the matching shockmount to your mic from the same company because they have specifically designed the suspension to support the mic. A lot of “universal” shockmounts have ribbons that are too tight, so more vibration will get picked up. You’ll need a suspension boom to hold the shockmount, and there are many styles that clip onto your desk and are easily adjustable. If you need some serious ambient sound control and you are okay with having a big metal arm reaching across your desk, then a shockmount could be a good investment, especially if you have a loud keyboard like I do. This is not total, comprehensive list of the things you can do to record the cleanest version of your voice for streaming or gaming, but they are the easiest things you can do to hear immediate results. Some might take some time, others will take money, but you’ll be one step closer to getting your ideal recording sound.